Châteauneuf-du-Pape, located in the Provence-Alpes-Côte d’Azur region in southeast France, is one of the most celebrated wine producing villages in all of France. It also has one of the wackiest wine laws in the world, one borne out of 1950s UFO hysteria. The village and its vineyards have an interesting history that dates all the way back to 1308. Châteauneuf-du-Pape translates to The Pope’s new castle — which is exactly what Pope Clement V had in 1309 when he moved the Papacy from Rome to Avignon, a city just down the road from Châteauneuf-du-Pape. The Popes of Avignon and their Court were actually fans of Burgundian wine, as the local stuff was pretty lousy 700 years ago. They, did however, make some major improvements to the local viticulture, figuring they might be there for a while (only 67 years in the end). Fast forward a few centuries, and we see that the contributions the Popes of Avignon made resulted in wines of such increased quality that the region was the first to seek out and receive protected AOC status. PARIS: A spate of reports of extraterrestrial visitors to France, coming from regions where the wine is more noted for its strength than its vintage, spread yesterday [Sept. 14] with the speed of a space-cadet. Marius Dewilde, a metal worker who lives at Quarouble (Department of the Nord), made known yesterday that he had seen what seemed to be two Martian visitors at his garden gate last Friday night. They alighted from a cigar-like machine which came to rest on the railway just outside his domicile. M. Dewilde described the visitors as of small stature, clad in something resembling a deep-sea diver’s costume. They had the appearance of human beings, M. Dewilde continued, but when he approached them the machine in which they had arrived set forth with a green beam of light which paralyzed him. When he recovered his sensibilities the cigar was taking off and the two beings had disappeared. The authorities have since noted unusual marks on the cross ties of the railway as though they had been made by the tail skid of some flying machine. Marius Dewilde showing the train tracks where he encountered an alien for a French newspaper article. Whether the mayor was actually serious about the law or merely seeking publicity for his region’s wines — a result that definitely ensued — we can say one thing: The law worked. 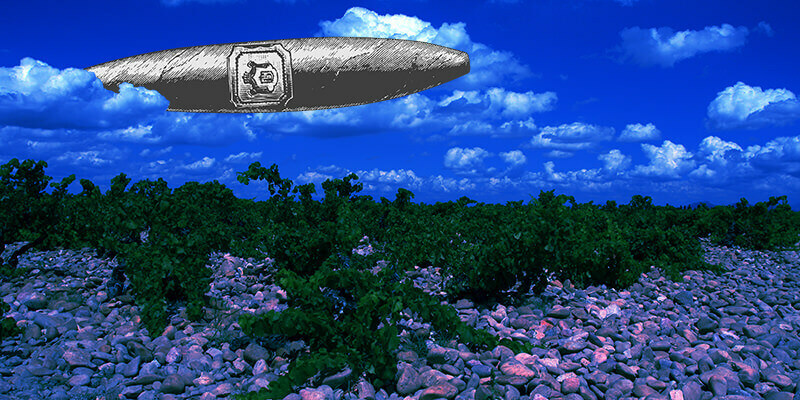 Châteauneuf-du-Pape has been alien and flying cigar-free ever since. At least as far as we know. If Cigare Volant sounds familiar that’s because you’ve probably seen a bottle of Bonny Doon’s wine that carries the name. Randall Grahm, the winemaker and founder of Bonny Doon, earned the nickname the Rhône Ranger for championing Rhône varieties in California. Paying homage to the region, Grahm named one of his wines after the municipal decree and the events that inspired it.